EasyAsk is a dynamic eCommerce search tool that integrates natural language for queries and analyses. This intelligent solution can aid you in increasing your revenues and in enhancing your conversion rates. Because of its natural language technology incorporation, EasyAsk can help you provide your customers with information that speeds up their shopping decision-making. On top of that, website visitors can use highly descriptive keywords or terms to narrow down the search results and to find the products they want faster. Moreover, EasyAsk removes inefficient searches. This means that customers never get a results page with zero entry associated with their queries. This is made possible by the solution’s various natural language techniques to ensure that shoppers always get a result. Instead of simple search queries and results, EasyAsk supports product concepts. With this, you can provide customers with an accurate group of products that match the description of their requirement. This means that the solution takes into consideration any attribute value they input in their searches such as color, size, and price range when searching for matches. With EasyAsk, you can offer a one-of-a-kind search experience to your shoppers as the eCommerce search tool intuitively guides them to their preferred merchandise. Because of its use of the natural language technology, the application is able to match attributes from any field to entries in your product catalog. Thus, you can direct customers’ attention to items from your collections. Instead of interrupting shoppers’ navigation of your product pages, you can promote selected items via the search bar. When customers use attributes related to your preferred products, EasyAsk pushes the related goods to the top of the search results page to direct consumers’ attention to them. When optimizing your search results, it is important to take into account what your shoppers have been searching for. EasyAsk’s integrated analytics tool can provide information about customer search and website interaction behavior. You can then use the information you can glean from the report to intelligently optimize searches and results. As customers type, EasyAsk rapidly searches for matching or related items in your catalog. This means that shoppers immediately get results even as they type. With this, you can assist them in making shopping decisions rapidly and increase the chances of conversion. If you are considering EasyAsk it might also be sensible to investigate other subcategories of Best Site Search Solutions collected in our base of SaaS software reviews. 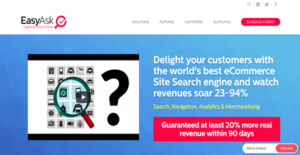 Each business is different, and might require a particular type of Site Search Solutions solution that will be designed for their company size, type of clients and employees and even specific niche they support. It's not wise to count on getting a perfect software that will work for every business no matter what their history is. It may be a good idea to read a few EasyAsk reviews first and even then you should remember what the solution is supposed to do for your business and your employees. Do you require an easy and intuitive service with only elementary features? Will you actually use the advanced tools needed by experts and big enterprises? Are there any specific features that are especially beneficial for the industry you work in? If you ask yourself these questions it will be much easier to find a solid solution that will match your budget. EasyAsk is a multifarious eCommerce search tool. It helps your customers find products, navigate your extensive catalog, promote selected items, and aids you in analyzing their search behaviors as well. If you are interested in powering your eCommerce business with the cognitive solution, you can request custom enterprise pricing from the sales team by phone, email, or web form. We realize that when you make a decision to buy Site Search Solutions it’s important not only to see how experts evaluate it in their reviews, but also to find out if the real people and companies that buy it are actually satisfied with the product. That’s why we’ve created our behavior-based Customer Satisfaction Algorithm™ that gathers customer reviews, comments and EasyAsk reviews across a wide range of social media sites. The data is then presented in an easy to digest form showing how many people had positive and negative experience with EasyAsk. With that information at hand you should be equipped to make an informed buying decision that you won’t regret. What are EasyAsk pricing details? What integrations are available for EasyAsk? If you need more information about EasyAsk or you simply have a question let us know what you need and we’ll forward your request directly to the vendor.